Using hexagonal tiles is a great way to instantly turn an ordinary bathroom into a modern and contemporary one. And, when they’re in shades of grey you also get the added bonus of creating a sophisticated space with lots of versatility. 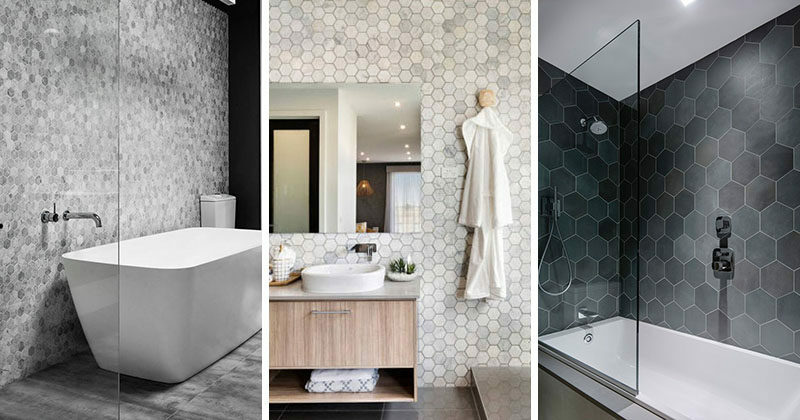 To give you an idea of how grey hexagon tiles can be used in a variety of ways in the bathroom, here are 8 examples of bathrooms that use the unique tiles to create modern and sophisticated looking spaces. 1. 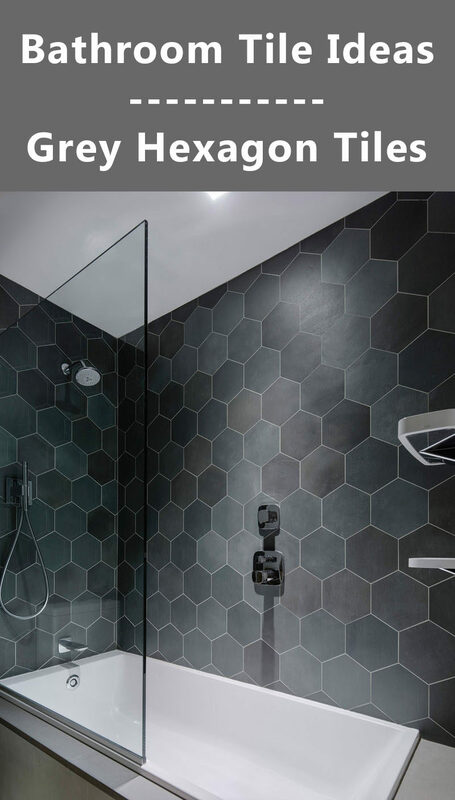 Hexagon tiles in various shades of grey line the walls in the 2-in-1 bath and shower in this bathroom. Inspiration from a bathroom designed by General Assembly. Photography by Joe Fletcher. 2. 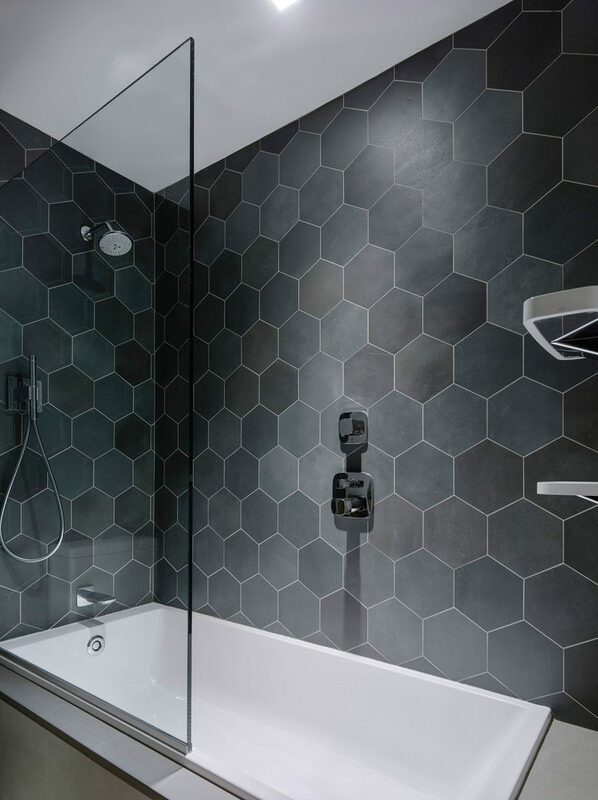 Dark grey hexagonal penny tiles cover the floor of this bathroom, contrasting the white and wood and adding a modern touch to the bright space. 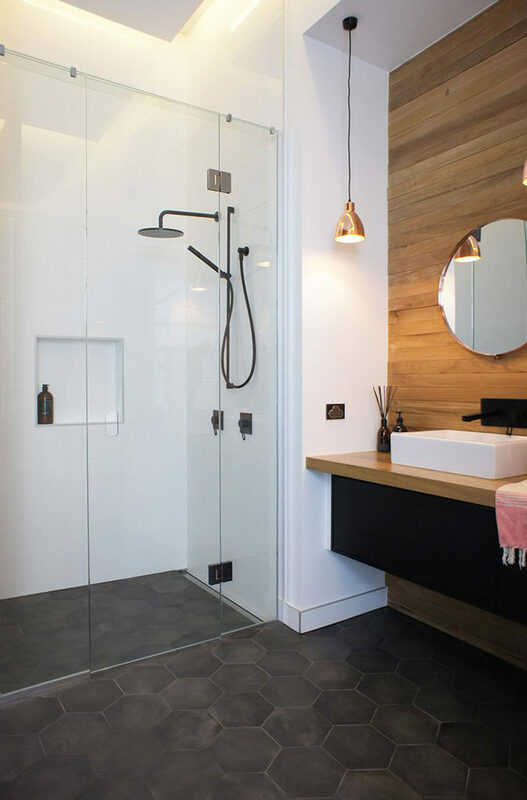 Inspiration from a bathroom designed by Tribe Studio Architects. Photography by Peter Bennetts. 3. 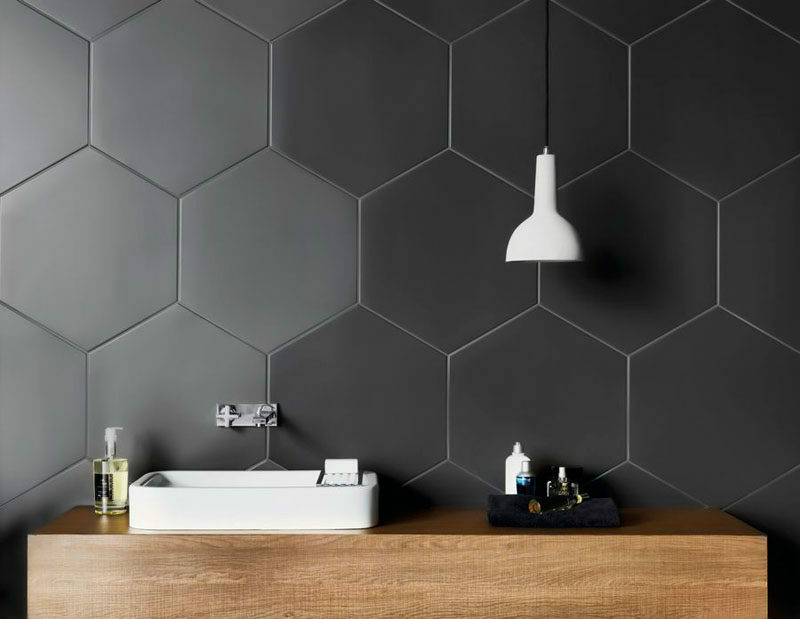 These grey hexagonal wall tiles stick out slightly from the wall to create a textured honeycomb look. Amsterdam 2D Hexagon Grey Tiles from Porcelanosa. 4. 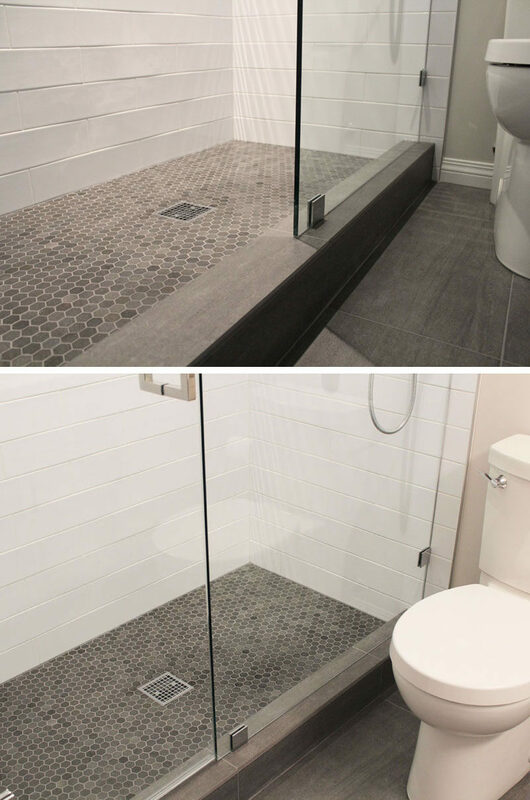 Small grey hexagonal tiles on the floor of this shower are in slightly different shades to add depth to the floor, and they work well with the grey tile on the rest of the floor of the bathroom. 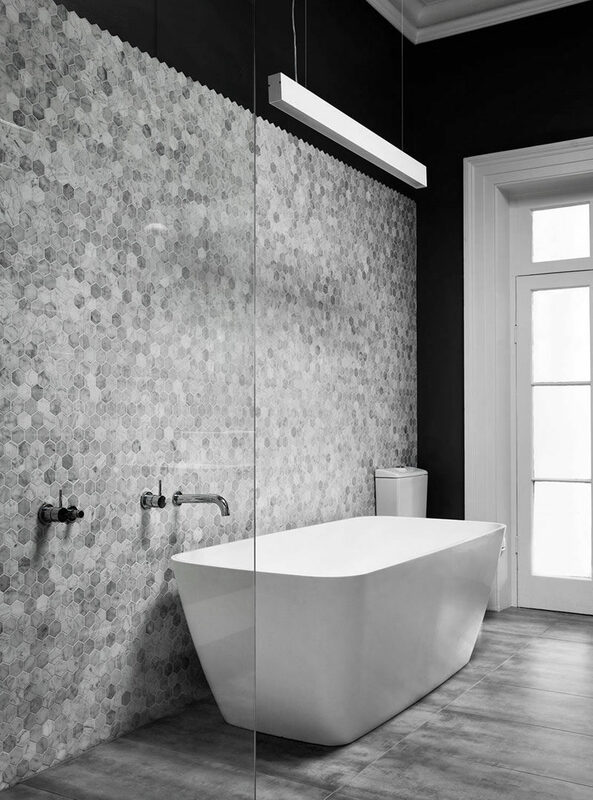 Inspiration from a bathroom renovation by Goldcon Construction. 5. Large hexagonal charcoal tiles on the walls of this bathroom create a unique, modern look that compliments the wood countertop and contrasts the white sink and light fixture. 6. The small grey hexagon tiles on the wall of this bathroom don’t reach all the way to the top of the wall, creating a zigzag pattern where the tiles stop. 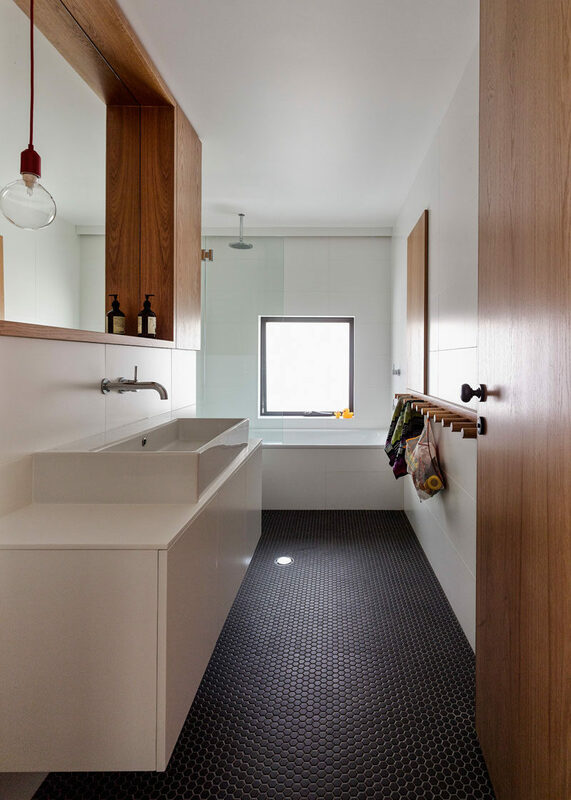 Inspiration from a bathroom design designed by Ross Tang Architects. Photography by Sharyn Cairns. 7. Dark grey hexagon tiles on this bathroom floor partnered with the wood paneled feature wall make the space feel modern and inviting. 8. 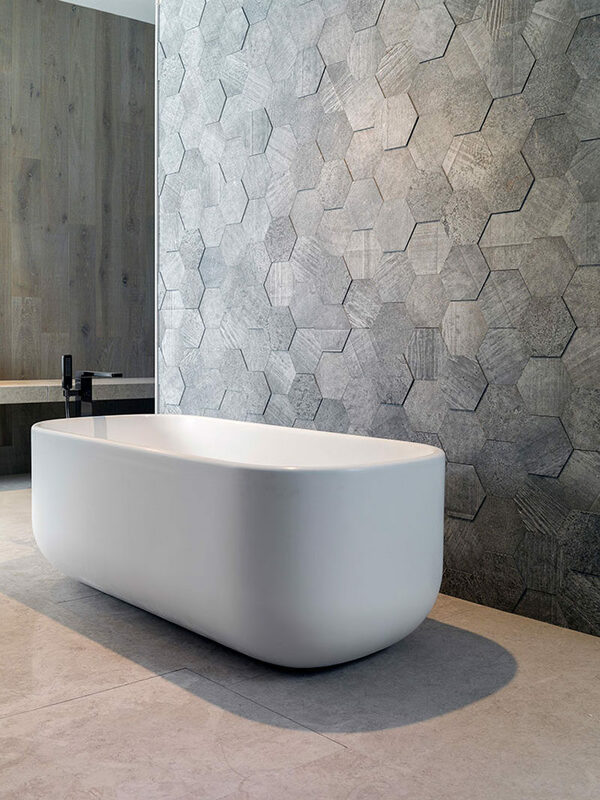 Grey and white marble hexagon tiles on the wall of this bathroom give the space a sophisticated and spa-like feel. 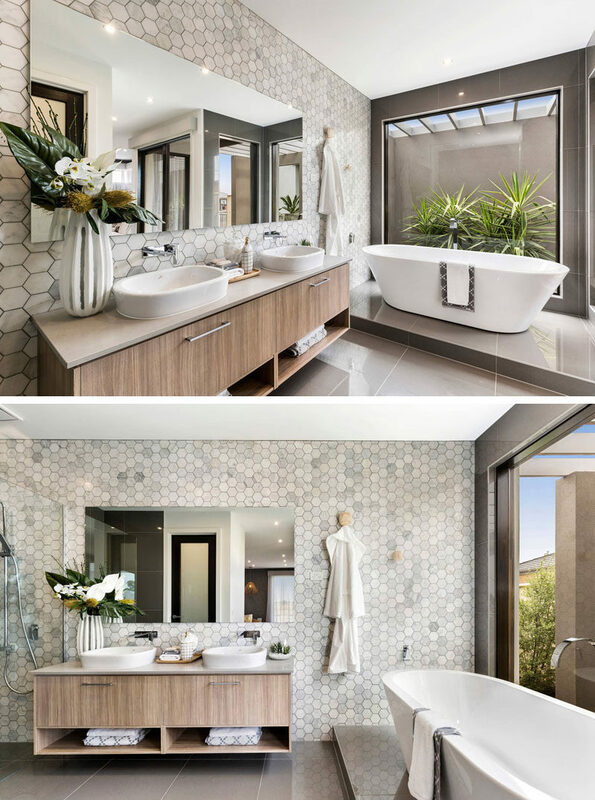 Inspiration from a bathroom designed by Metricon.